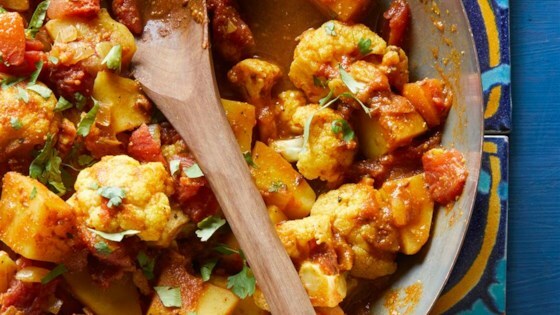 "Traditional Indian cauliflower and potato curry recipe from my mom. We used to eat this all the time growing up. My sister likes it with peas too." Place the cauliflower in a large, microwave-safe dish; cook in microwave on High for 3 minutes. Transfer the cauliflower to a bowl and set aside. Put the potatoes in the dish and cook in the microwave on High for 4 minutes. Pour into the bowl with the cauliflower. Heat the olive oil and cumin seeds in a large skillet over medium-high heat until the cumin swells and turns golden brown; stir the onions into the oil and cook about 3 minutes. Add the tomatoes and cook and stir another 3 minutes. Fold the cauliflower and potatoes into the mixture. Season with the curry powder and salt. Continue cooking until completely hot, 3 to 5 minutes. Serve hot. More curry powder and some vegetable broth makes this recipe saucy and great with rice. I like it with garlic naan and sriracha, which is not very traditional but yummy. This was fabulous! I only had one fresh tomato, so added a can of diced tomatoes (no salt). The entire family loved it. Thanks for sharing!